Whether you would like to make a monthly or one-time donation, donate for your birthday, set up an employer match, or create a bequest there are many ways to give to help change lives through the power of writing! Pledge to change lives through the power of writing today! Inkwell is Write Around Portland’s group of sustaining donors who believe in respect, writing and community. Inkwell members contribute monthly to provide a base of support that sustains our free programming. In 2018 the group contributed $20,000 to expand access to writing and publishing for voices in our community. To celebrate our 20th anniversary, we’re launching a campaign to reach 200 Inkwell members by 2020! Help us reach our 200 member goal. Join Inkwell today. Current stats: 104 members, 50% to our goal. Internships are available year round (Spring: Jan-May, Summer: June-Aug, Fall: Sept-Dec). We value diversity in all its forms, and highly encourage people from all socioeconomic levels, races, ages, ethnicities, nationalities, genders, sexual orientations, health statuses, physical and mental abilities, education levels, religions and backgrounds to apply. For more information and to apply, please click here. When someone joins us for a workshop, we give them their very own journal. Providing a donated journal to every participant conveys that our community truly does value their stories and their lives. 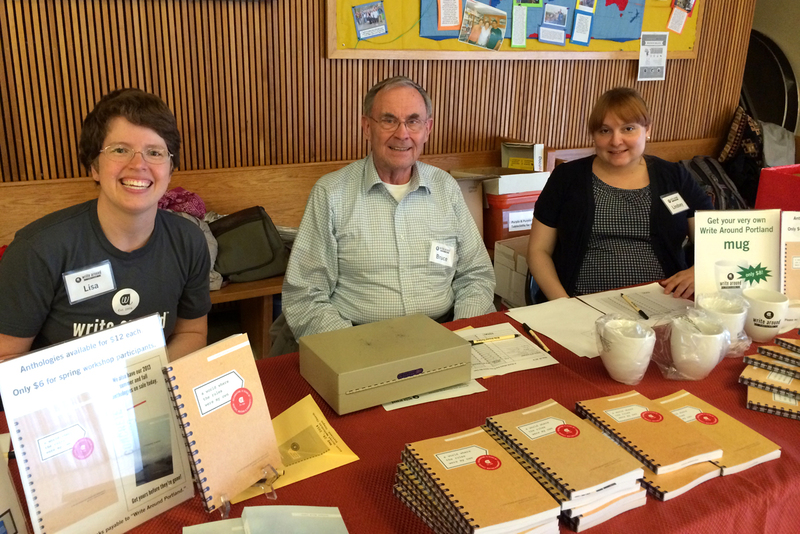 We are honored to hold journal drives in partnership with Portland area businesses, schools and places of worship. A journal drive is like a food drive. We provide a collection box, signs, sample announcements and anything else that would make it easy for you to host a journal drive. Call 503-796-9224 or email info@writearound.org to learn more about hosting a journal drive. If you would like to help by personally donating a journal, you can drop it off at our office. Workshop participants are eager to share their stories with new audiences. We are happy to host a reading or writing workshop in your home to introduce your friends and family to Write Around Portland. A house party and reading is a great way to change lives through the power of writing. We’ve designed a House Party Host Guide with hosting tips and ideas. There are other ways to help raise funds for Write Around Portland, too. Here are 8 fun & easy fundraising ideas! For more info, call 503.796.9224.